Whether you’re opening up your very first commercial kitchen or you’re thinking about updating an existing kitchen area, it’s vital that you pay close attention to the regulations and requirements of what needs to be included within it. These requirements have been put in place, not only to maintain the health and safety of your staff and customers, but to ensure a pleasant overall experience when working and dining at your premises. They will also ensure that any residents in the nearby area are happy to have your commercial kitchen closeby. In this guide, we cover the main requirements of what needs to be included within a commercial kitchen. Here you can equip yourself with the knowledge that is needed to create a healthy, safe and environmentally friendly commercial kitchen. Many local authorities require commercial kitchens to have an odour and nuisance control plan in place, in order to gain planning permission. Odours being expelled from a commercial kitchen can cause a nuisance in the local community, as can smoke, grease and other pollutants. As such, having the correct control measures in place is something which will satisfy local authorities and residents with the running of your commercial kitchen. Certain ventilation and extraction systems will work to reduce grease, smoke and odour emissions into the surrounding outdoor areas. These systems will help to filter and purify the air as it leaves the commercial kitchen, in a way that will comply with the guidelines of your local authority. Noise control is something which local authorities and residents will take very seriously. It’s in your best interests to make sure that residents are happy to have your kitchen closeby, and keeping noise pollution to a minimum is one of the ways in which to ensure this. Local authorities will work to make sure that your business isn’t going to affect the standard of living in the area, so they will be paying close attention to the noise pollution and how you go about reducing it. Systems are available to invest in, which will help to lower the amount of sound coming from your commercial kitchen, but you will want to make sure that the system itself doesn’t create a lot of additional noise. To make the most of these systems, where possible, they should be placed inside the building, at a distance far enough away to avoid creating additional noise in a residential area. Additional noise attenuators can sometimes be added to reduce the noise levels further. It is a legal requirements to make sure your kitchen provides adequate ventilation, in order to maintain a temperature which is safe for staff to work in. 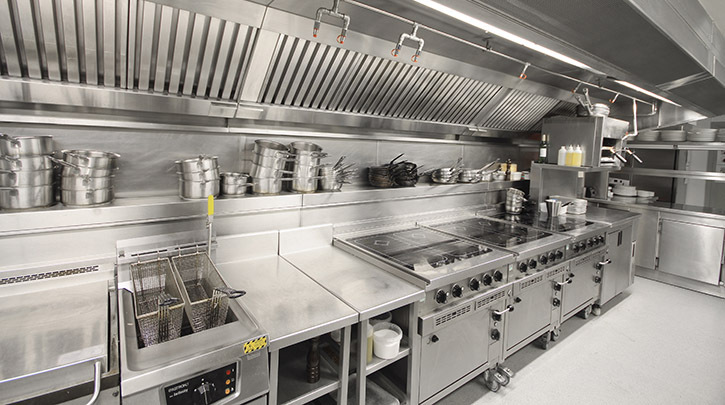 Commercial kitchens are known to reach high temperatures during their busiest periods, due to the amount of equipment being used and the number of team members working within the space. In order to keep workers comfortable and healthy, invest in a ventilation system that will help to remove hot air from the space. Noise and odour controls are taken very seriously by the majority of local authorities, and their regulations fall under the Environmental Protection Act 1990. It is, therefore, so important to plan in these investments, along with any additional processes aimed towards controlling these nuisances, prior to going ahead with any planning permission applications. Additional areas to consider when planning out your commercial kitchen are adequate storage, food preparation areas and sink areas. Each of these considerations will work towards boosting the health and safety of your commercial kitchen, whilst providing a pleasant place to work and dine in, too. To boost health and safety standards, make sure to provide enough storage to keep ingredients fresh and stored at the right temperature, all whilst avoiding contamination at the same time. There should be a variety of storage to ensure each of your ingredients can be kept in the right climate needed to keep them fresh and safe to eat. 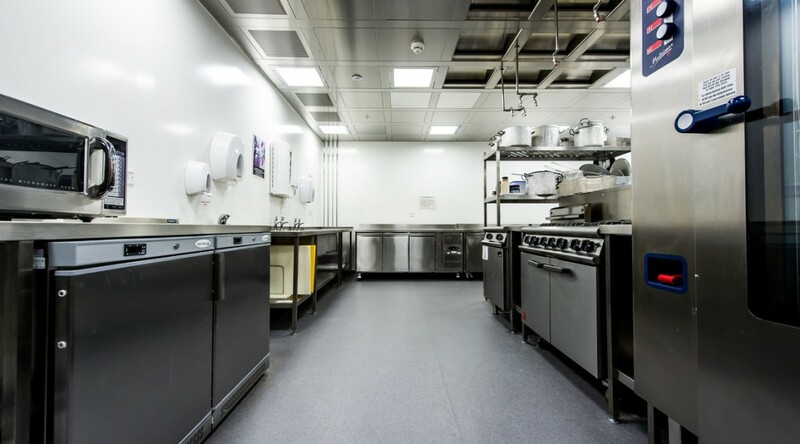 Providing designated food preparation areas for different types of food is essential to maintaining the health and safety standards of your commercial kitchen. A variety of food preparation areas should be provided for raw meat and fish, vegetables, desserts and pre-cooked foods, for example. Environmental Health Officers will encourage owners of brand new commercial kitchens to invite them to inspect any plans or designs you had in mind, before going ahead and creating the physical space. Top tip: Food preparation areas should always be provided in a separate space to the cooking area, to avoid contamination of the food that is cooking. Your commercial kitchen should have separate sink areas for food prep, for pot washing and for hand washing, too. Food prep sinks should be segregated further into meat and fish prep and vegetable prep, for example, to avoid contamination and problems further down the line. Although these requirements are just a drop in the ocean of what to consider when developing a plan for your commercial kitchen, they are certainly a good place to start. Each of these requirements should be considered during the planning stages of building your kitchen. That way, you will be ready to present these considerations as part of a planning permission application, which will better your chances of having your commercial kitchen approved, ready for you to kickstart its development.